A new study by ethnobotanists Ina Vandebroek and Michael Balick was just published in the journal PLoS ONE (and it's open access!). The article reports on a study conducted in New York City that measured medicinal plant knowledge among first generation immigrants from the Dominican Republic. The authors begin by explaining that the study participants noted a difference between food plants used as medicines and nonfood plant medicines. Food plants used as medicines made up 39% of the reported plants used by immigrants in NYC and knowledge of such plants was reported at a higher average per person than were nonfood medicinal plants. This finding goes against most reports that traditional knowledge is typically lost or diminished among migrant populations. It has been argued that the new environments in which migrants find themselves make it difficult to transition their traditional knowledge, while the stress of migration makes it difficult to add to that prior knowledge base. This study shows otherwise. I found it particularly interesting when the authors attribute the increase in knowledge of food medicines to the use of botánicas among Latino populations in NYC. 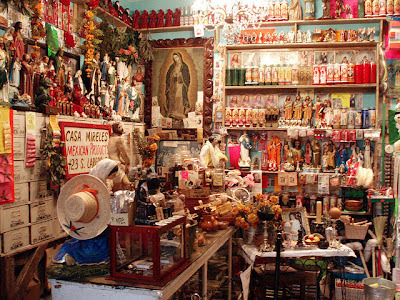 Botánicas are herbal/spiritual shops that are in many cities across the U.S., and are usually found in Latino neighborhoods. My research with botánicas in Tampa, FL showed that most shops offer consultations to customers. While, for legal reasons, the consultations are not advertised as medical, they do offer insight into a variety of health issues from the perspective of numerous medico-spiritual traditions actively practiced throughout Latin America and the Caribbean. My study (to be published in the open access journal vis-à-vis in September) posited that botánicas play a vital role in the overall health of its customers and may satisfy spiritual and psychological aspects of health and healing that are neglected by biomedical facilities. Other studies on botánicas have shown that they also offer important social space to customers who are often immigrants or children of immigrants. Some shops have become places where people gather to share remedies, stories, and other spiritual- and health-related information. The shops have become a safe space in which to discuss health and illness from a perspective that rests outside of the biomedical paradigm. This new study by Vandebroek and Balick reinforces this finding, and shows that people are not only using the botánica as a social space, they are learning there, and in turn expanding their knowledge base, and perhaps improving their health and that of their friends and families. I think this kind of herbal plants are even used for small health problems like stomach upset or headaches or even colic and liver ailments and which can be cured in a very short period of time !